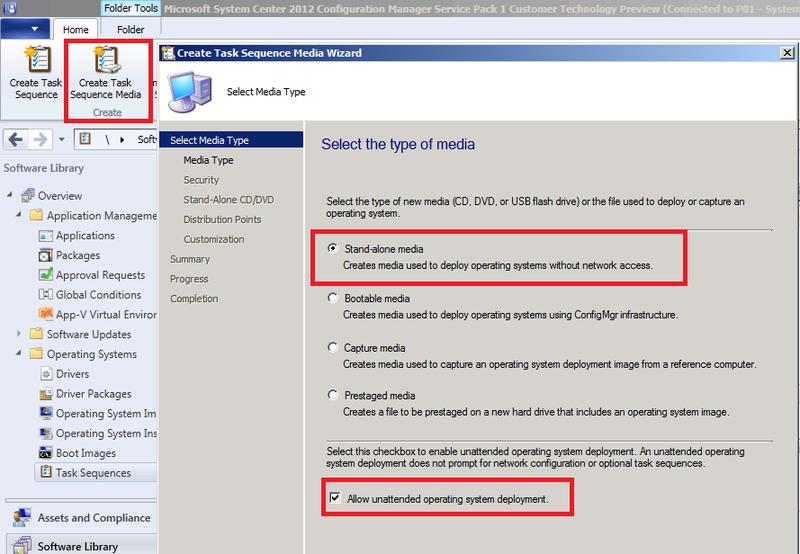 How can I deploy Windows 8 in UEFI mode using Configuration Manager 2012 ? The Legacy BIOS that we are all accustomed to has been around for a long time and is showing it’s age, for example it cannot handle discs larger than 2TB in size. Realizing the need for change, Intel originally created the Intel Boot Initiative back in 1998. Within a few years a bunch of well known companies (including Microsoft, HP, Dell, AMD and others) got together and formed the UEFI specfication which was the next logical step in its evolution. Unified Extensible Firmware Interface (UEFI) is meant as a replacement for the legacy BIOS present in all IBM PC-compatible personal computers.As a result, most modern computers today will have a bios that is both Legacy (bios) and UEFI capable, for example on a Dell Latitude E6320 you have both options available in the BIOS screen under the General, boot Sequence, Boot List Options menu. More than likely it’s already set to Legacy, but we will be changing that later in this post. Microsoft introduced UEFI for x86-64 Windows operating systems with Windows Server 2008 and Windows Vista Service Pack 1, so the 64-bit versions of Windows 7 are compatible with EFI. 32-bit UEFI is not supported since vendors did not have any interest in producing native 32-bit UEFI firmware because of the mainstream status of 64-bit computing. 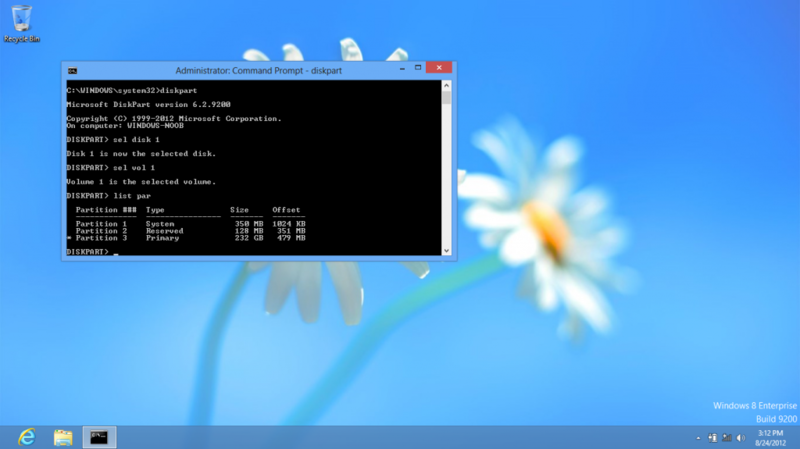 Windows 8 includes further optimizations for UEFI systems, including a faster startup and secure boot support. 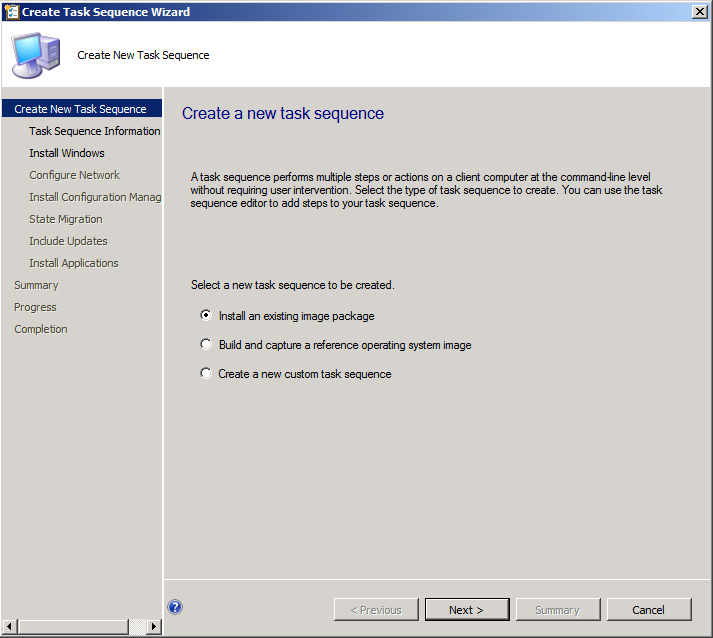 With the recent release Windows 8 RTM and updates released for Configuration Manager 2012 to support Windows 8 (amongst other things via the CTP release of SP1) we now have the ability to create task sequences with UEFI abilities built in. But first before you try using UEFI please understand one thing, it’s very different to what you are used to with the traditional bios so there is a learning curve. Don’t expect PXE boot (via UEFI) to work currently as network drivers for it are not readily available (you might see them on certain servers, contact your hardware manufacturer for details). 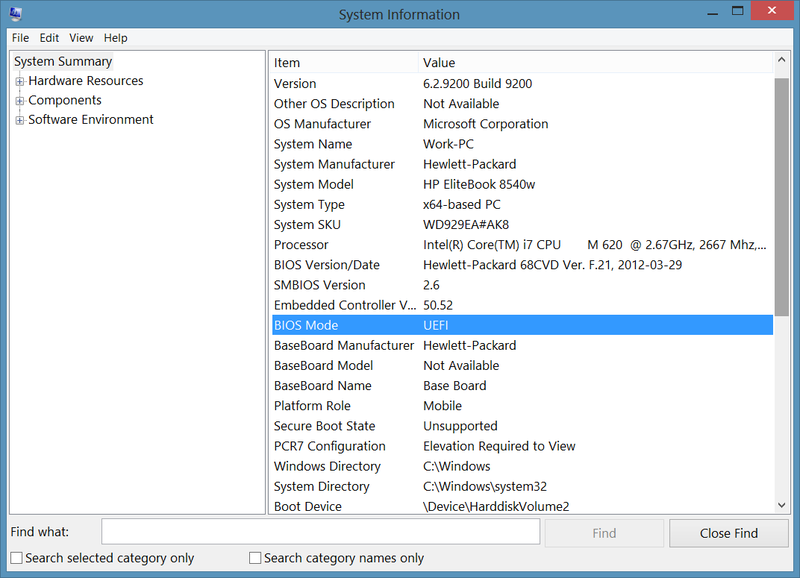 Most OEM manufacturers are releasing UEFI capable computers nowadays but check the actual bios/computer specifications online first (or verify with the manufacturer) before attempting this. In my BIOS screenshots in this post I’m using a Dell Latitude E6320 with Bios version A05. This laptop is both Legacy Bios and UEFI capable. If your computer is not UEFI capable then you’ll have to get one that is (if you are lucky, a bios upgrade on your computer to the latest version may enable this functionality). 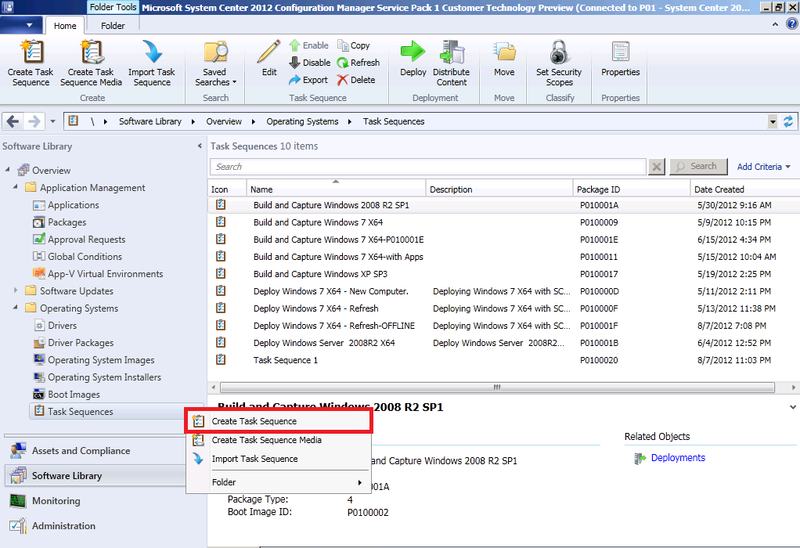 To deploy Windows 8 in Configuration Manager 2012, you’ll need to install the Windows Assessment and Deployment Kit and to upgrade ConfigMgr to Service Pack 1 which is currently in Community Technology Preview phase (CTP 1). See here for a link describing how to install both.Note: As a result this means you have to do this in your LAB as the CTP release is not supported in production. Step 3. Add Operating System Image. When the wizard appears, browse to the path of the Windows 8 installation media, and select the Install.WIM file contained in the Sources folder of that media. 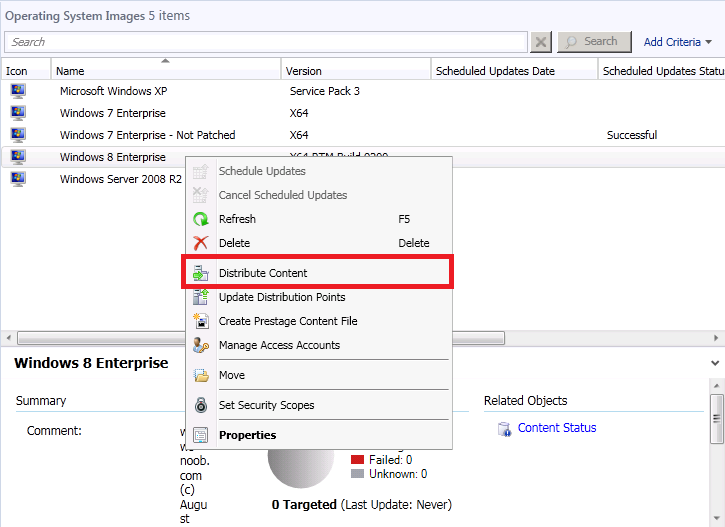 You can review content status to verify that your WIM image has reached your distribution points. 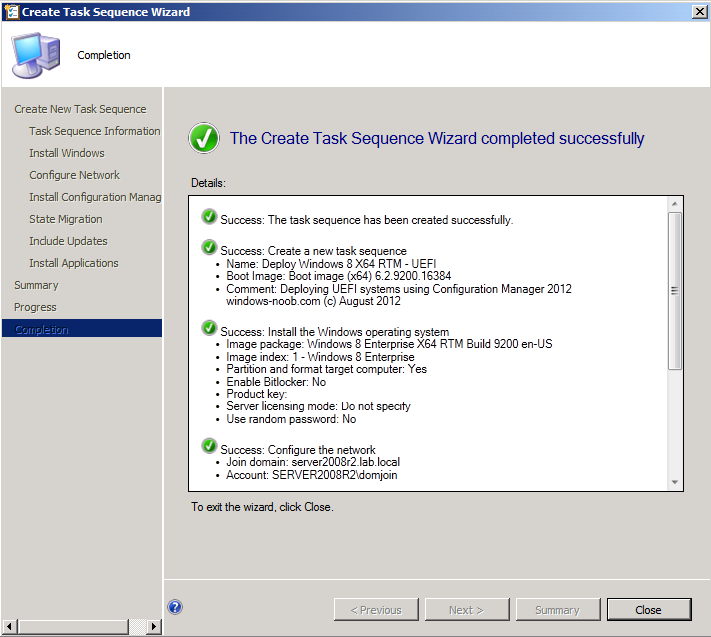 fill in some details about the task sequence including a descriptive name, make sure to select a X64 boot image (64 bit boot image). 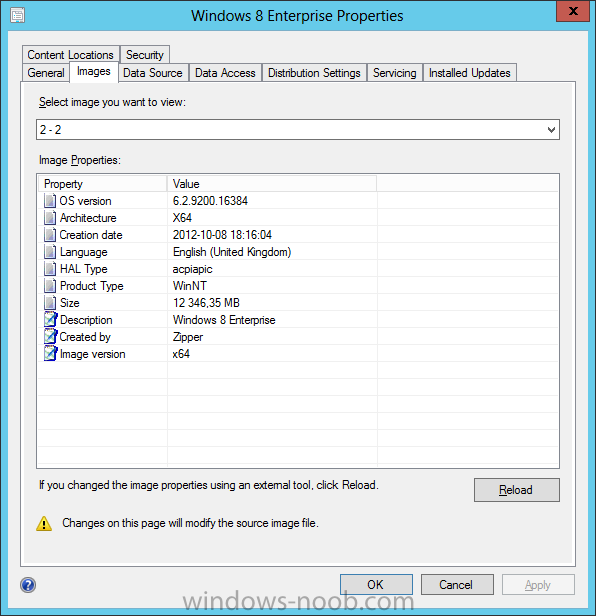 Select our previously added Windows 8 RTM install.wim file and make sure that the format and partition step is selected, also type in your Windows Product Key (blanked below) and enter an administrator password. Note: if you are using a previously captured Windows 8 WIM file which has more than one image index, make sure to select the image index that contains the Operating System otherwise you will not be given any UEFI options in the task sequence. 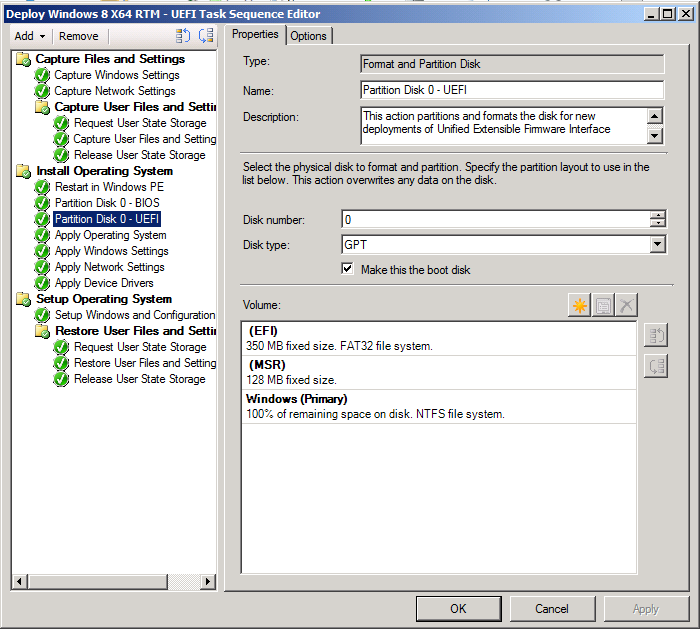 Right click on your new task sequence, choose Edit, take note of the Partition Disk 0 – UEFI step, if it is not present, please review my Note above. 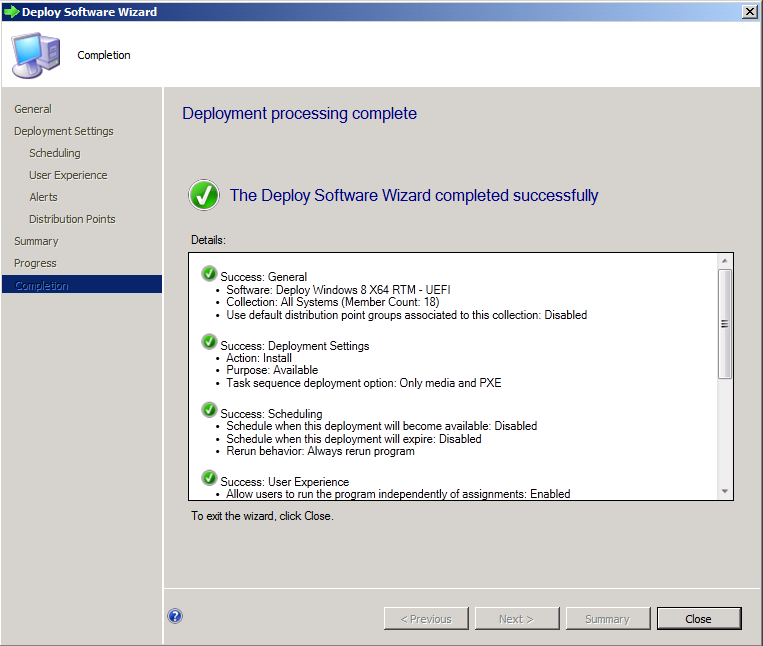 Right click our task sequence, select Deploy, choose a suitable collection, and make the task sequence available (optional). 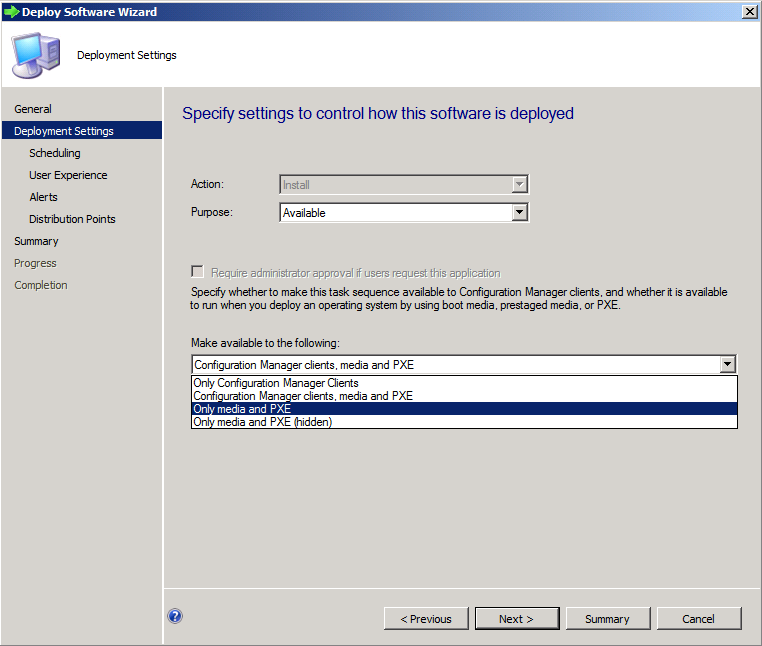 Note the new options on the Deployment Settings screen, select only media and PXE. Note: Don’t deploy task sequence to All Systems in production, otherwise bad things can happen. 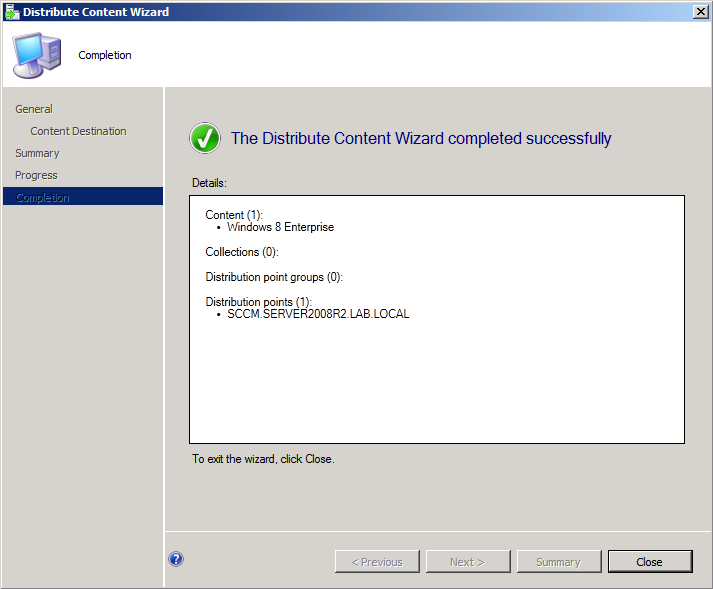 Instead, use specifically created OSD collections and add resources that you want to Deploy to those collections. This is a LAB so for the purposes of this post it’s ok.Step 7. 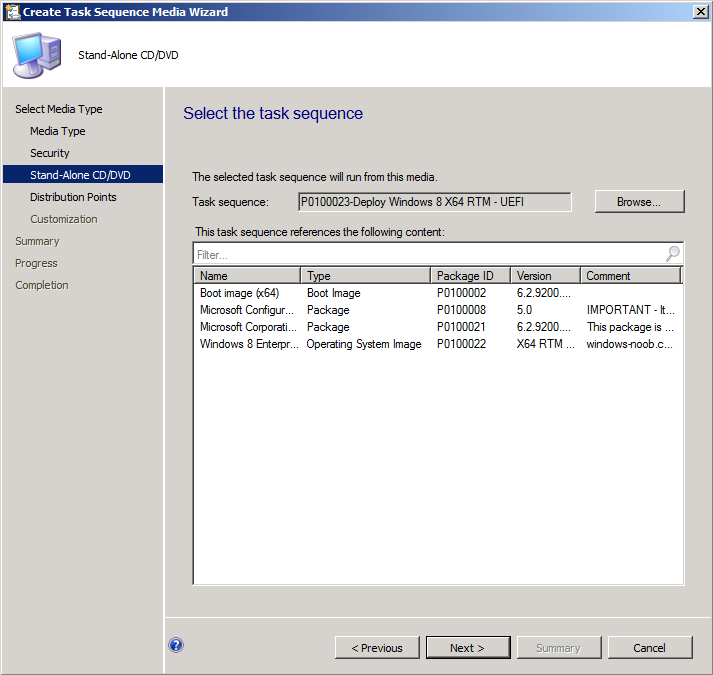 Create Task Sequence Media (USB Flash Drive)In the ribbon select Create Task Sequence Media, select the first option (Standalone) and click next. flash drive plugged in.Select USB Flash Drive and point to your inserted USB key. 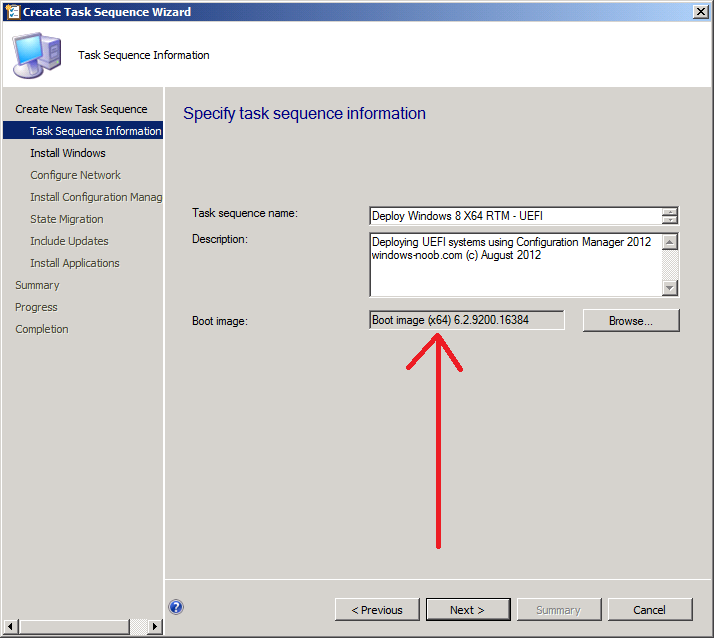 Enter a security password if required then at the next screen select our Deploy Windows 8 X64 RTM – UEFI task sequence, wait until the referenced packages are listed in the box below. and now you can take a break while the USB Flash Drive get’s created..
On your UEFI capable computer, boot into the BIOS Setup screen and enable UEFI as the boot type. 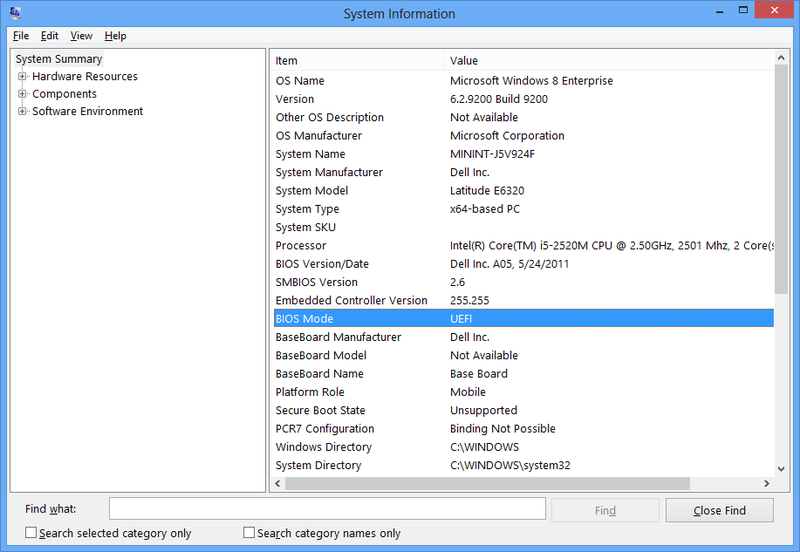 The screenshot below is from a Dell E6320 (the UEFI bios options look different on Lenovo but can enable the same functionality), select boot sequence, and then Boot List Option in the bios screen, by default Legacy is selected, choose UEFI from the list. Save your settings and exit from the Bios. Now you are ready to boot to UEFI. 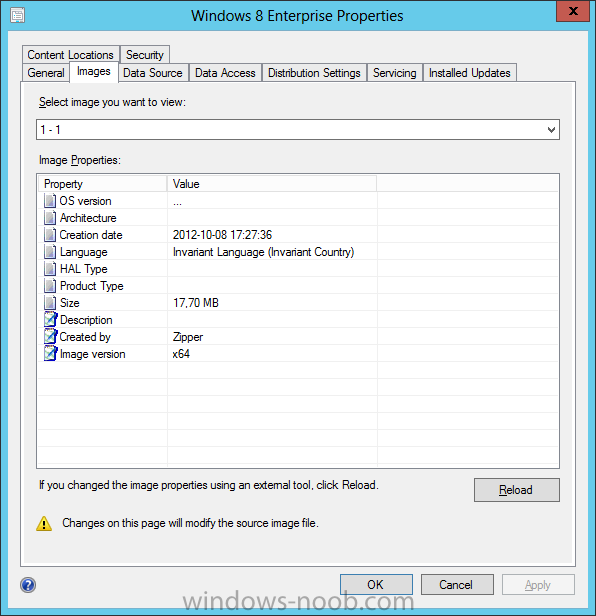 Select the UEFI device and press enter to start deploying, you’ll notice once the partitioning step starts that it is partitioning the disk for UEFI. Note: if it states that it’s partitioning the disk for BIOS instead then you are not getting a UEFI deployment and you’ll need to press F8 and start reading the SMSTS.log file to find out why. and that the read only variable _SMSTSBootUEFI is set to True.Once Windows has finished deploying you run can diskpart you’ll see it has created the UEFI partitions also. Step 11. Further reading about UEFI. 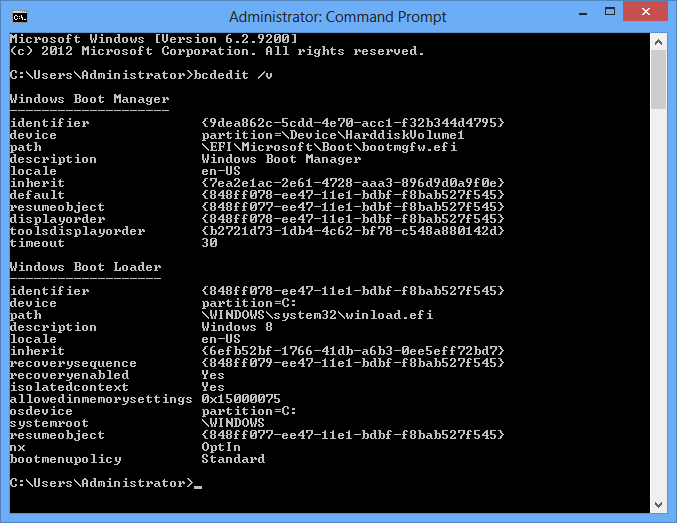 The following links will give you some good information about UEFI. 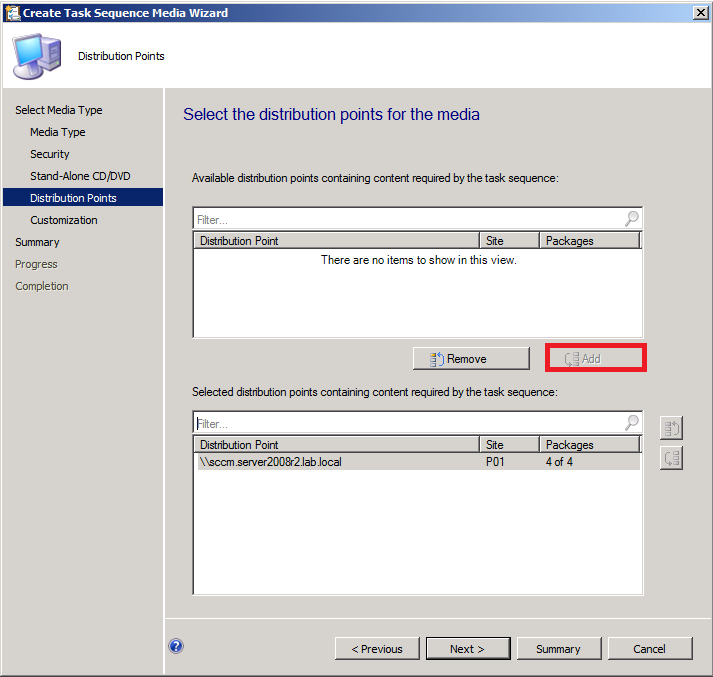 If you create task sequence media using the ISO option (CD/DVD) and then extract/copy that content to your USB flash memory then it will be missing certain required EFI files. Note that doing it this way is unsupported !. Is there any talk about when we will be able to network boot UEFI devices? Just to demostrate how good UEFI really is, i posted this clip when i boot my laptop and the boot times are amazing! very cool indeed, once you get the hang of UEFI it's very straightforward, next you need to try UEFI and pre-provisioning of bitlocker together ! That´s really cool with the Dell ! I actually have that modell at my customer right now and they want to me to setup a POC for Windows 8, to bad SP1 is not out yeet. Im also going to try pre-provisioning next week when im back at the office. Exciting stuff indeed! Having some trouble now when im trying to do this in the labb env at work. This is how the smstslog looks like. 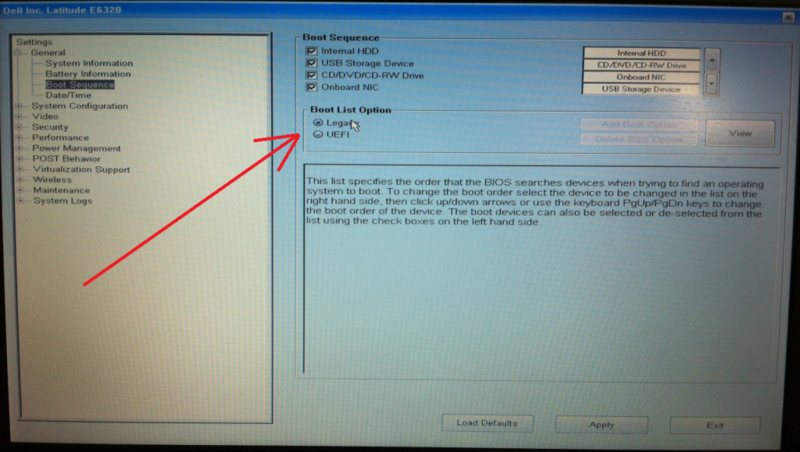 (attached) , the problem is that the USB i boot from reserves the driver letter C? 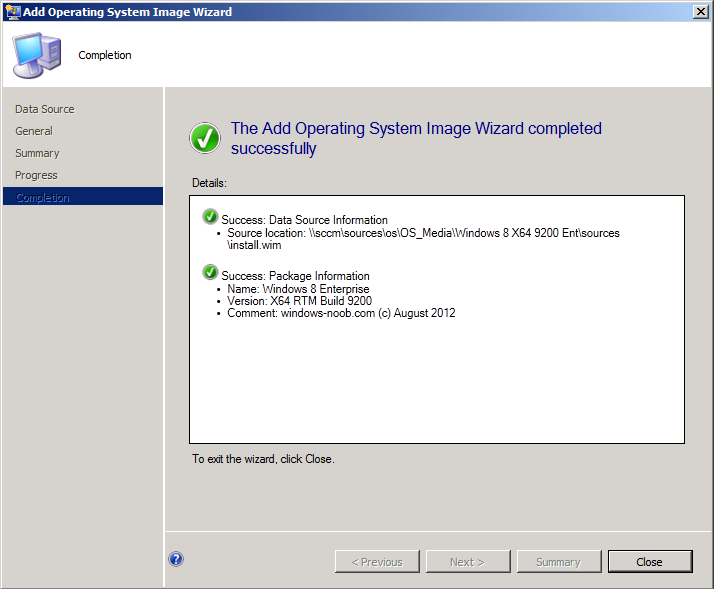 It fails when i reach the "apply operating system image"
hmm have you done anything different when creating this key ? this is also in SP1 beta ? Strange, any idea what could have caused this? check the image index, was it different between the two ? Yes the first two pictures is the wim from the build and capture. The second one is from the Windows 8 org media. Org media i only have 1 index. to resolve you'll probably have to point out which one contains the WIM file, probably index 2. Windows 7 UEFI = Success! Hehe how do you bear with it, is it really that "fun", am i missing something, it goes a little bit faster to boot a computer with UEFI, and that's it? Are there any other benefits that i have missed? Check out the movie under Hardware "Delivering a secure and fast boot experience with UEFI"
This is all great info, but what if I need to deploy to a UEFI tablet with no legacy bios option, and my task sequence media to copy to USB stick is greater than 4gb? I can't seem to figure this out. I can create stand alone media >4GB and copy it to a bootable USB stick and get it to work fine for standard bios, but when it comes to a UEFI device i'm struggling to get it to recognise the USB stick. Can anyone point me in the right direction? well what errors are you seeing ? is the device X86 or X64 ? 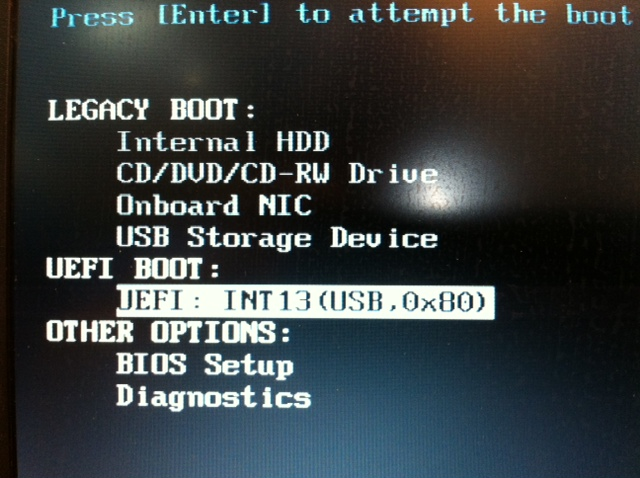 Yes sir, the problem is that you cant boot UEFI unless you are using FAT32 on the USB stick, that is indeed a problem. But what you could do is to create a BOOT USB stick , just for booting and then connect to your CM server and install everything that works fine! So Format usb->FAT32 put the boot files on there and go! good luck. Nice info, thank you very much. I hope the product team is aware of this problem and will add a new dialog option for UEFI boot sticks. I followed the steps in this guide and everything worked great. 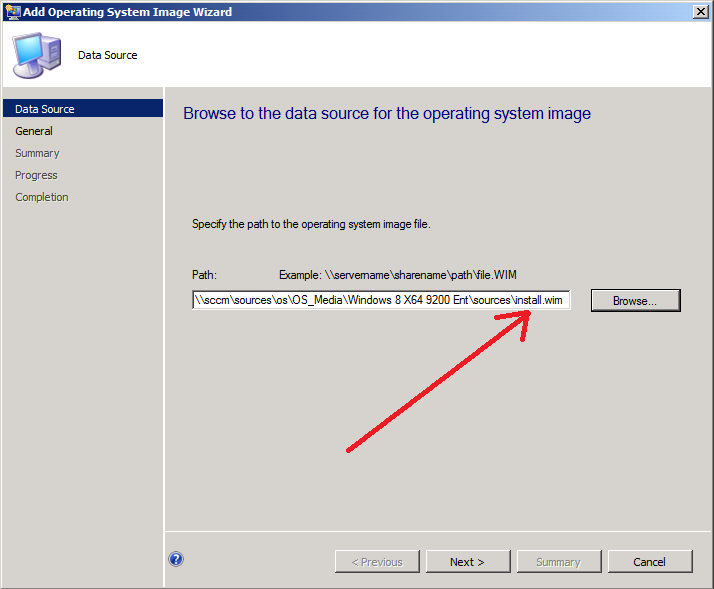 Has anybody tried to use the offline servicing feature with the Windows 8 wim file? When I attempt to image a workstation with the patched wim file I get an error message in the task sequence when windows attempts to start the first time. The message says the windows is unable to configure one of it's components. Has anybody been able to use scheduled updates with Windows 8? Disregard this post... I reverted to an older Hyper-V snapshot and accidentally installed the RTM version of System Center. I need details on how you are partitioning the hard drive. You have a note that says "Right click on your new task sequence, choose Edit, take note of the Partition Disk 0 – UEFI step, if it is not present, please review my Note above.". I have combed over this article at least three times looking for your note and I must have a visual block cause I don't see it. 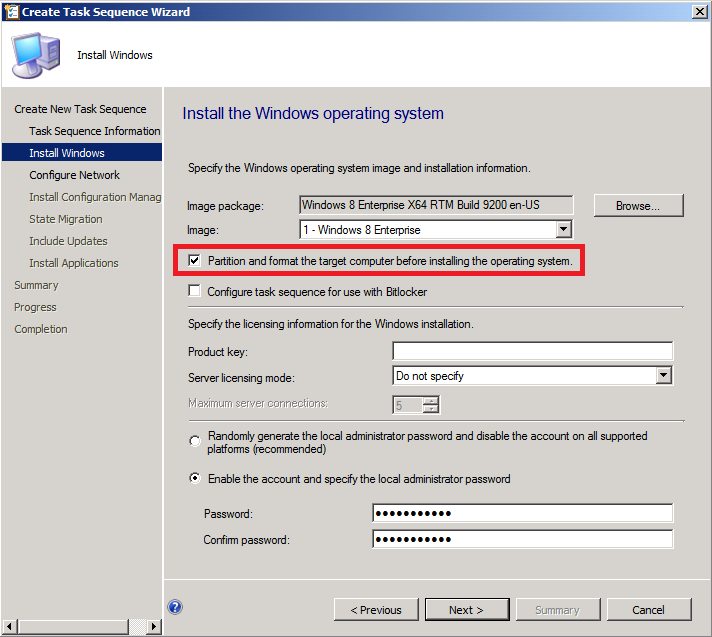 This is easy to do with diskpart but how do you make it do an EFI and MSR partition. Normally I'd expect them to be in the drop down list with Primary and Hidden. 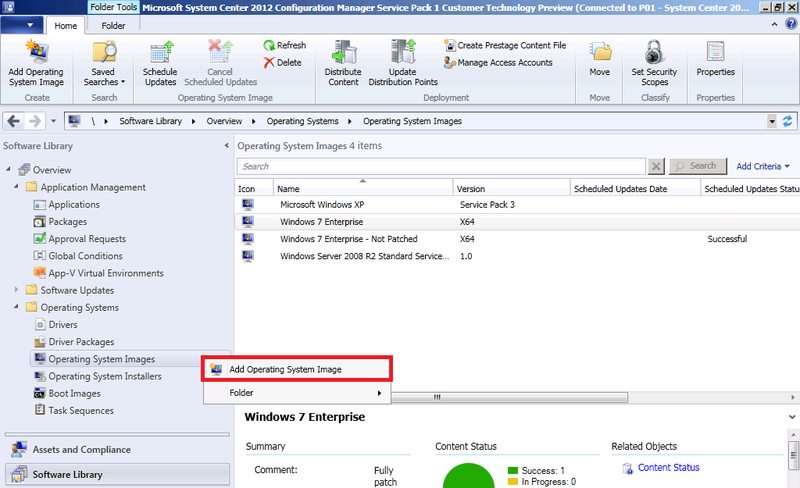 I've just done a fresh install of System Center 2012 with SP1 on a 2012 server using SQL 2012 with SP1.